Ask nutrition professionals today how they’re promoting their businesses and brands and spreading nutrition messages, and most will probably tell you they’re doing this through social media outlets such as Facebook, Twitter, and Pinterest; websites; blogs; videos; and even writing books. Others will say they’re taking advantage of public speaking opportunities as well to further expand their professional influence, boost their income, and take their careers to a higher level. Many dietitians start small by speaking at venues such as local and regional conferences, neighborhood hospitals, nonprofit organizations, schools, local chambers of commerce, community education events, and faith-based organizations. Many participate in public seminars, webinars, and corporate speaking and eventually go on to deliver keynote addresses and presentations at national meetings. Today’s Dietitian interviewed RDs with public speaking experience who discuss what it takes to get started, how to set goals, and the importance of choosing a specialty for long-term success. Because there are many different public speaking paths dietitians can take to complement their business, including becoming a consultant or coach, it’s best to determine what you want to accomplish and set business goals. “Do you want to get more clients, diversify your revenue, increase exposure?” asks Stacy Tetschner, CAE, CEO of the National Speakers Association in Tempe, Arizona. According to Michelle May, MD, CSP, a Phoenix-based motivational wellness speaker, the founder of Am I Hungry? Mindful Eating Programs and Training, and the author of Eat What You Love, Love What You Eat: How to Break Your Eat-Repent-Repeat Cycle, dietitians need to ask themselves why they want to do public speaking. “Everyone always has to start with why. You have to know why because that helps find your audience,” she says. For example, if a dietitian’s goal is to build her practice, she can look locally for prospective clients at community events, mothers’ groups, support groups, or corporate lunch and learns. “A dietitian is well qualified to speak at these [venues]. 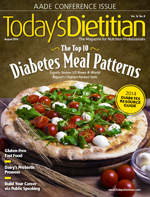 Being a dietitian is the perfect segue into a variety of topics,” May says. A retired family physician, May had a medical practice for 16 years. When she started the mindful eating program Am I Hungry? in 1999, she gradually transitioned to become a full-time entrepreneur, helping others run mindful eating programs. She started speaking publicly to health professionals in 2000 to share information about mindful eating and how it could help their patients and clients as well as at community and corporate wellness events and at many other programs to help individuals. “We also train dietitians in mindful eating, so I speak at RD events. They might follow up with our facilitator training program or have patients or clients to refer to our programs or books,” she says. As a member of the Arizona Academy of Family Physicians, May spoke at local chapter events, where she received valuable feedback while honing her speaking skills. She eventually applied to speak at the national convention, where she’d speak for the next 10 years. May recommends RDs turn to the Academy of Nutrition and Dietetics (the Academy) to get public speaking experience, starting with the local chapter and moving up to the state and eventually the national level. Karen Collins, MS, RDN, CDN, FAND, a speaker, writer, and consultant and the nutrition advisor for the American Institute for Cancer Research (AICR), joined this group early in her career. In fact, it was during one of the speakers’ meetings at FNCE that Collins was encouraged to specialize in a certain aspect of nutrition. “At first I wanted to be broad, but in order to be a speaker, [you should] be an expert on something, a subject matter such as weight control or a group like the elderly, kids, or people in business. I think it’s valuable to have a niche,” she says. Eventually, Collins specialized in cancer. Early in her career, Collins spoke at group classes and hospital events and as a clinical instructor at Cornell University, all of which helped build her confidence. Becoming the nutrition advisor for the AICR transitioned her from small to much larger conferences and audiences. “It’s a great way to reach out to people,” she says. When dietitians are hired to speak, it’s important for them to determine how much they’re worth. “I spend enormous amounts of time” preparing for presentations, Collins says, including research and figuring out how to condense it, the take-home message, and the PowerPoint slides. Tetschner suggests dietitians consider what they earn annually as an RD, determine how much time they’d have to give up to speak, then figure out how many times per year they’ll need to speak at a particular rate to net the amount of money they want to earn in one year. However, dietitians shouldn’t expect to get paid for public speaking when they’re just starting out. In fact, many RDs begin speaking for free. “A person should never do paid [speaking] until he or she has done a ton of free [engagements]. Your reputation as a speaker is only as good as your last speech. Get really good and comfortable on the platform. No one will pay good fees for a so-so speech,” May says. Unpaid speaking also can be lucrative in other ways. Grotto has experienced his audience members looking for dynamic speakers, which has led to more speaking opportunities. He’d ask these audience members to provide testimonials and make referrals that he’d use as marketing tools to get hired for other speaking events. “It’s worth its weight in gold—better than a PR company,” he says. Another way to capitalize on free public speaking is to have a book to sell at the event, otherwise known as back-of-the-room sales. During speaking engagements, many dietitians sell books they’ve written and do well. “I found that my first book became a living, breathing business card for me,” Grotto says. “Being an author has huge appeal when people are looking for a speaker,” adding that he’s seen self-published books bring in six figures from back-of-the-room sales. For authors who have publishers, arrangements can be made to allow the group or organization to buy several books at the wholesale price (typically 50% less than retail), and sales at the event would go toward supporting the organization. “It’s a win-win. You get credit for book sales, and you’re helping the event,” Grotto says. Speaking for free often is easier to accept when you feel honored for being invited, says Barbara Ruhs, MS, RD, LDN, a retail food and health marketing communications specialist and former supermarket dietitian who currently operates the consulting business NeighborhoodNutrition.com. The event administrators may waive your conference fee and offer other perks, she says. “It’s always been about education and opportunities. I’ve been a leader in creating education opportunities for other supermarket dietitians. Others know this and seek me out,” she says. In fact, Ruhs once received an all-expenses-paid trip to Japan to learn about probiotics and an invitation to tour behind the scenes at Grimmway Farms to see how they harvested carrots. “They know I’m vocal in this area and talk to lots of dietitians,” she says. As a coordinator for the Nutrition Education and Training Program, which is under the Child Nutrition Act, it was part of Ruhs’ job to teach school foodservice professionals how to comply with the National School Lunch Program nutrition guidelines. She has hosted conferences for dietitians and has had many television and print media opportunities. “In public health, you’re always looking for ways to maximize your impact. Media is a way to reach a lot of people,” she says. When Ruhs became a supermarket dietitian 14 years ago, it was a natural fit. The media reached out to her as a local voice, and it was good marketing for both Ruhs and the supermarket for which she worked. She says the most important part of public speaking is sharing what she’s learned with others. When she started her career as a supermarket dietitian, she saw a need for resources that would help supermarket dietitians do their jobs in the communities they served to the best of their abilities. She saw the opportunity to specialize in a particular niche, became the expert she was seeking, and now people seek her as a public speaker for supermarket dietitians. While becoming an expert helps garner more speaking engagements, there’s much more to public speaking than meets the eye. “You build up a reputation, but you have to be relevant; you have to be front of mind,” Grotto says. In other words, you need to market yourself. Grotto was busy completing his master’s degree program last year and noted the decrease in speaking engagements compared with the year before when he was actively promoting himself and doing more public speaking. “You never stop pitching. You have to get out there,” he says. While speaking in front of audiences comes naturally for some dietitians, it doesn’t for others. Fortunately, there are plenty of resources to fine-tune and master the skill of public speaking. Toastmasters International, a world leader in communication and leadership development, helps professionals develop speaking skills and gives them practice in front of an audience. Of course, there’s no better teacher than getting experience speaking in real life situations. “Ninety percent is the way you say it, 10% is what you say,” Grotto says. “The thing that seems to work the best is repetition. You’ll develop your style,” adding that he recommends nutrition professionals watch other speakers and note what they do that audiences enjoy. In addition to the Nutrition Entrepreneurs DPG, the National Speakers Association can show professionals how to use speaking to make a living. “We help people gain the tools—the education and the professional community—they need,” Tetschner says, noting that people don’t have to do this on their own. There are 3,000 members of the organization who make speaking a full-time business. Those just starting out can find out who’s doing what they’d like to do and learn from their experiences, he says. “Dietitians have expertise that people are interested in,” May says. “Speaking is a great way to help people, build your business, and help serve.” Dietitians need to set business goals, determine the ideal audience for their niche topic, and pitch it, she says. Start small and speak for free to get the experience and keep at it. Public speaking can give dietitians higher profiles that can open doors and opportunities that not only can build their business and brand but elevate their careers. • National Speakers Association (www.nsaspeaker.org): Provides resources and education designed to advance the skills, integrity, and value of its members and the speaking profession. There are state and regional chapters throughout the United States. • Nutrition Entrepreneurs Dietetic Practice Group (http://nedpg.org/about), speakers and media specialty group: Represented in all 50 states, this group provides colleague support in the business of speaking professionally on wellness and nutrition topics. • Toastmasters International (www.toastmasters.org): Members improve their speaking and leadership skills by attending one of the more than 14,000 clubs worldwide. • Six Minutes: Speaking and Presentation Skills (http://sixminutes.dlugan.com): This site provides tips and strategies for developing presentation skills and becoming an effective and confident public speaker. • TJ Walker (www.tjwalker.com): Walker is the host of the top-rated YouTube channel devoted to public speaking and media training improvement. This site features helpful videos that address various aspects of public speaking skills.